Mestre Peixe’s achievement in 2004 was the highest belt of Capoeira, the black belt, from the founders of Capoeira Brasil and guests Mestre Acordeon, Mestre “Antonio” Vargas, Mestre Lobão, Mestre Peixinho, Mestre Gato, Mestre Hulk, Mestre Rã, Mestre Ramos, Mestre Cabeça, Mestre Indio, Mestre Girino, Mestre Naval, Mestre Mão Branca, Mestre Paulão and Mestre Boneco. André Cerutti was given his capoeira nickname by Mestre Boneco at his first grading. The name Peixe Ensaboado means ‘slippery fish’. 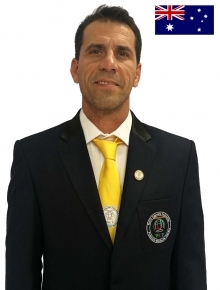 Mestre Peixe was born in Rio de Janeiro, Brasil on the 25th January 1969 and began his training with Mestre Boneco in 1985. Prior to this he had trained in a number of martial arts, but found Capoeira captured his attention after watching a display by Mestre Boneco. After joining his family in Australia in 1992, Mestre Peixe hoped to train Australians in the same way he was trained in Brasil. From small beginnings, hundreds of people have been introduced to Capoeira through Mestre Peixe. Some of these have gone on to qualify as Capoeira instructors and teachers and continue to work with Peixe under the Group Capoeira Brasil banner. Mestre Peixe has helped to contribute hugely to the standard of Capoeira in Australia. He has brought many of the great Capoeira Mestres out to Australia for workshops and festivals and has given demonstrations, festival performances and made appearances in film and television.